These amazing pieces are folded from .999 fine silver. This is more pure than sterling, which is 92.5% pure silver, and why most sterling is stamped “925”. Fine silver is the purest form of silver used in jewelry making, and when polished to a high shine achieves a mirror like surface that will last. Most “origami” jewelry you see is actually cast from a mold or stamped from sheet metal. My works are true origami, folded from sheets of silver using the exact same folds you would with paper. 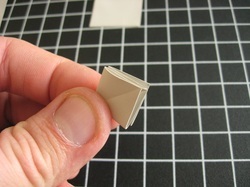 They can be tiny, highly intricate, and take special tools and lots of patience to make correctly. I've worked for years to develop exclusive techniques for working with PMC and folding metal, and to create one of a kind pieces you cannot find anywhere else. My work starts from a medium called Precious Metal Clay, or PMC. This is a form of powdered silver with organic binders and water added to give it the consistency of clay. It can be formed, molded, sculpted, and yes, even folded like origami paper. Once it dries, it gets fired in a kiln which burns off the organic binders, leaving .999 fine silver. This is then highly polished, and attached to a chain or ear wire to make pendants and earrings. Highly polished fine silver will keep its shine for a long time. It only needs the occasional wiping with a soft cloth to keep it shiny. Over years, it will slowly oxidize and turn grey. I recommend a fine silver polish like Silvo, or a polish embedded jewelry cloth for the occasional cleaning. These can be found at the jewelry counter of most departement stores. Antique finished fine silver will oxidize slightly faster. All my oxidized items are given a light coating of jewelers wax to protect the finish, but with everyday use this may wear off and the items will turn grey/black as they tarnish. Occasional cleaning with a soft cloth or polish embedded jewelry cloth will keep it looking like new. Beautiful and so unique! I get so many compliments! I can now show off my whimsical side without seeming childish! I shopped around for a while before picking this pendant for my wife, and I was very pleased with the quality and price. It arrived well packed in a box pretty enough I didn't even feel the need to gift wrap it. Yes, Im a real person! Every item in this shop is handmade by me, folded with care in my little basement studio just outside St Louis, Missouri. This means you wont see hundreds of identical items cast from molds, and every piece is unique. I chose the name "Allegro" for my business, as I started my career as a musician. Its a musical term that means "brightly, with life", and I like to think that applies to all my art. I have been folding origami as a hobby since I was very young, and working with metal jewelry for 12 years. It was in 2008 when I first combined the two and started creating the metal origami jewelry. Since then, my art has been in craft fairs, art shows, and museums worldwide.